The asteroid 2014 DX110 is identified in this image from a Slooh half-meter telescope during the asteroid's close flyby of Earth on March 5, 2014. The 100-foot asteroid passed within 217,000 miles of Earth. 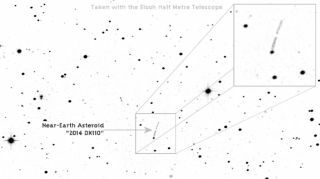 Editor's Update (March 6): Asteroid 2014 DX110 flew safely by Earth Tuesday and was spotted by the Slooh online skywatching website using its half-meter telescope. You can see the initial image above. You can see a video of asteroid 2014 DX110 here captured by the Virtual Telescope Project. A newfound asteroid will buzz close by Earth today (March 5), flying safely between our planet and the orbit of the moon, and you can follow the space rock encounter live online. Two web-based skywatching services, the online Slooh observatory and the Virtual Telescope Project in Italy, will attempt to offer free live views of asteroid 2014 DX110 during its flyby. You can watch both asteroid flyby webcasts on Space.com here, beginning at 3:30 p.m. EST. The webcasts are heavily dependent on weather conditions at the observing sites. The first asteroid 2014 DX110 webcast at 3:30 p.m. EST comes courtesy of the Virtual Telescope Project overseen by astrophysicist Gianluca Masi in Ceccano, Italy. The webcast will cover the incoming asteroid's approach and closest flyby to Earth during today's space rock encounter. Masi observed the asteroid Tuesday night by telescope, snapping a photo that revealed the asteroid to be a white pinprick of light in a sea of black space. You can follow Masi's webcast directly at the Virtual Telescope Project website here. At 4 p.m. EST (2100 GMT), the Slooh observatory will webcast its own coverage of asteroid 2014 DX110 using the company's remote-controlled telescopes. Slooh's Paul Cox will host the observing event. Slooh officials said it will be a challenge to see asteroid 2014 DX110 because, "with its small size, location, and incredible rate of motion, there is a high probability we will not capture the asteroid during the broadcast." The asteroid 2014 DX110 is seen as a point of light in this image from the Virtual Telescope Project in Ceccano, Italy, captured on March 3, 2014. Today's webcast is one of two asteroid live events in a single week by Slooh. The online skywatching project will host a second webcast on Sunday night (March 9) to track the newfound asteroid 2014 CU13. Asteroid 2014 DX110 was discovered last week by astronomers using the space rock-hunting Pan-STARRS 1 telescope in Haleakala, Hawaii. The telescope is one of many around the world used to seek out and track near-Earth objects. NASA's Near-Earth Objects program at the Jet Propulsion Laboratory in Pasadena, Calif., oversees one of those efforts. "NASA detects, tracks and characterizes asteroids and comets using both ground- and space-based telescopes," JPL officials said in a statement. "The Near-Earth Object Observations Program, commonly called 'Spaceguard,' discovers these objects, characterizes a subset of them and identifies their close approaches to determine if any could be potentially hazardous to our planet." Editor's Note: This story was updated at 3 p.m. ET to correct the date of the flyby (March 5).